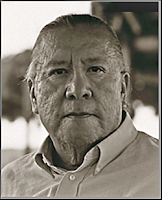 Our friend Leonard Little Finger, who was born and raised on the Pine Ridge Indian Reservation died last weekend (4/8/17) at his home in Oglala, South Dakota, surrounded by family. He was 77. A respected elder within the Lakota community and one-time administrator of the Indian Health Service facility at Pine Ridge, Leonard had strong ties to Dawes County. He attended Chadron High School in the 1950s, graduating in 1958. He had fond memories of his years at CHS and – with some of his family – attended a class reunion in 2009. He appears in several reunion photos in this CHS Reunion Gallery. Unbeknownst to most of his high school friends, many of Leonard's ancestors were victims in one of the most horrific incidents in American history – the Wounded Knee massacre of 1890, which claimed the lives of some 300 Lakota men, women and children. A great-great-grandson of the famous Lakota leader Big Foot, Leonard had 39 relatives caught up in the massacre. Only seven survived. His story was among many recounted about Wounded Knee in the November-December 2015 edition of South Dakota magazine. In 1990, on the 100th anniversary of the Wounded Knee massacre, Leonard met at the White House with President George H.W. Bush to present a photo of Big Foot. One hundred years earlier, in 1890, the revered Lakota leader had planned to visit President Grant in Washington. Because of Wounded Knee, it was a meeting that would never take place. Leonard and I crossed paths a few times in recent years, and during one visit he shared his continuing quest to help to preserve Lakota culture and language. I posted a story about Leonard's Dream in 2008. For decades, he worked tirelessly to reclaim Lakota artifacts that had been spirited away by others. In 2000, he was able to recover Big Foot's hair lock that was held be a collector in Massachusetts. It was one of his many accomplishments in cultural preservation. One night wake service for Leonard Little Finger was conducted on April 14, 2017 at the Brother Rene Hall in Oglala, SD. Funeral services were held Saturday, April 15, 2017. Burial was at Our Lady of the Sioux Catholic Cemetery near Oglala. Note: (4/17/17): Like so many who knew Leonard from his high school years, I remember him as a thoughtful and caring person. As our paths crossed in later years – the 1980s – he was serving as Administrator of the Indian Health Facility at Pine Ridge. He was enmeshed in a campaign to battle alcoholism on the reservation. Leonard seemed always committed to improving the lives of his Lakota brethren. His life story and achievements reach far beyond his obituary and this posting. 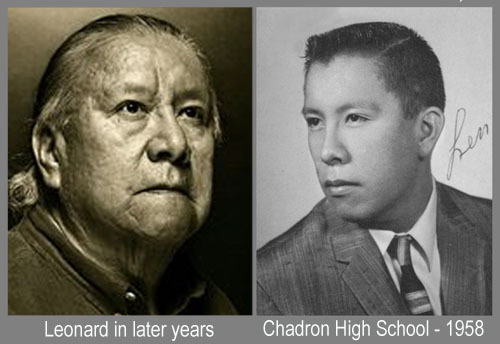 Another friend of Leonard's – Con Marshall – has written a story containing some wonderful recollections of our friend Leonard Little Finger as shared by some of his classmates at Chadron High School.